Today, I'm linking up with Amy Abbott to write about some of my favorite folk songs for fourth grade! 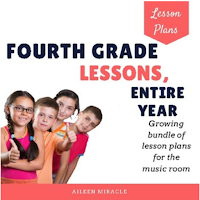 Whether you are "on track" with your curriculum or a little behind, I've got great singing games that fourth graders absolutely love! For the game, three students are chosen, and they stand in a line. On the first “chewbelew,” the first student does a standing long jump. On the second “chewbelew,” the second student jumps, and on the third “chewbelew,” the third student jumps. The student who jumps the farthest wins, and challenges two more students in the next round. If any of the children touch the ground with their hands, fall, or jump one-footed, they are disqualified. The song can be used to practice tika-ti, or to prepare or practice ti-tika if you focus on anything but measures 3-4. It's also great for high do! It would also be great for older beginners, just to get them singing! 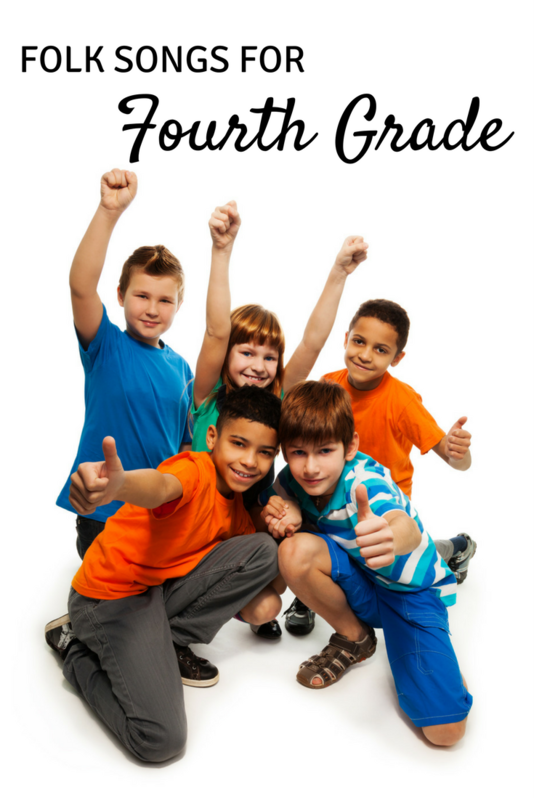 The game is so fun that you can encourage students that they will only play the game if they sing! This is one of my favorites, that I learned about from Joan Litman in my Kodaly Level III class! I have a whole blog post just about this song; click here to read all about it! For the game, one child is chosen to be a sow, while another is chosen to be the farmer. The rest of the students stand in rows, with arms stretched out, touching their neighbor’s shoulders. These are the “cornfields.” The sow hides in the cornfields and the farmer stands in front of the cornfields. The song is sung, with the farmer chasing after the sow, and at the end of each phrase, students switch the direction of their bodies and arms. For example, if they are facing north at the beginning, at the end of the phrase, they turn so they are facing east. Because the cornfields change, the path the farmer takes in chasing the sow has to change! He/she has to be careful not to be “clotheslined”! At the end of the song, a new farmer and sow are chosen. The game is SO fun and different than any other game I've taught them! 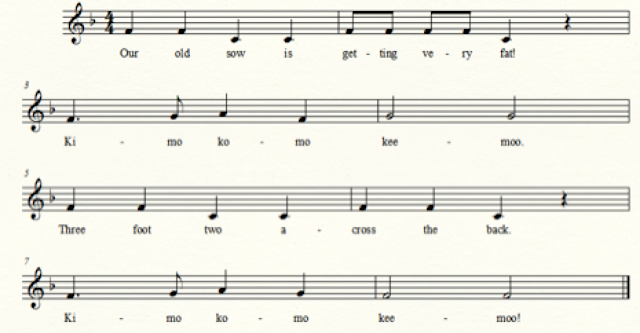 The song could be used to teach low sol, and to teach tam-ti, or dotted quarter/ eighth. 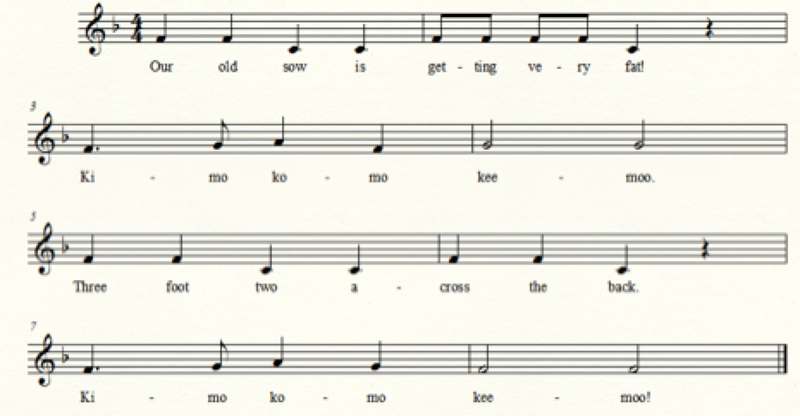 You could also use it with older beginners--I'd focus on the second and fourth phrases for do-re-mi. I learned this African-American song from Sue Leithold Bowcock. The notation not on the staff is spoken. For the game, students stand in a circle with hands facing up, their left hands under their neighbor’s hand and their right hands above their neighbor’s hand. When the song begins, one student crosses their right hand over their body to tap the hand of their neighbor on their left. The beat continues around the circle until “1, 2, 3, 4, 5.” If someone gets their hand tapped on “5,” they are out; if they pull their hand away in time, the person who was trying to tap their hand on “5” is out. The person who is “out” goes to the middle of the circle until more people join him/her, and two games can occur at the same time. This song is great for syncopa and for practicing re or the do pentatonic scale. Older beginners could use it to distinguish between singing and speaking voices. 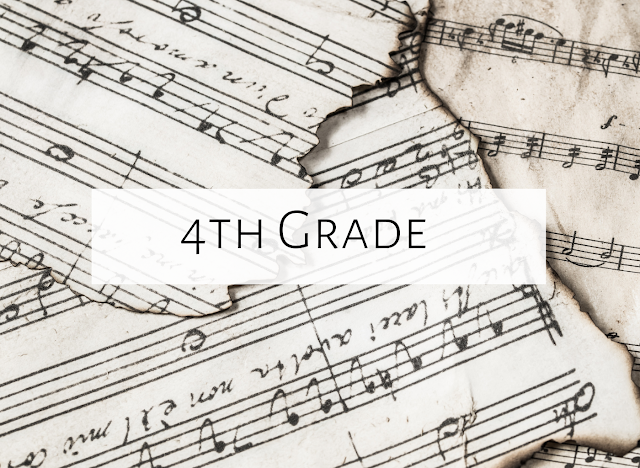 There you have it...my five favorite folk songs for fourth grade! 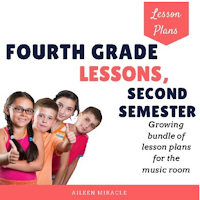 If you are looking for more materials for fourth grade, I've just posted these two sets: one set with lesson plans for the second semester of fourth grade, and one for the entire year. Both are growing bundles, and have tons of lessons, materials, visuals, and more! I absolutely love your use of games for the songs! 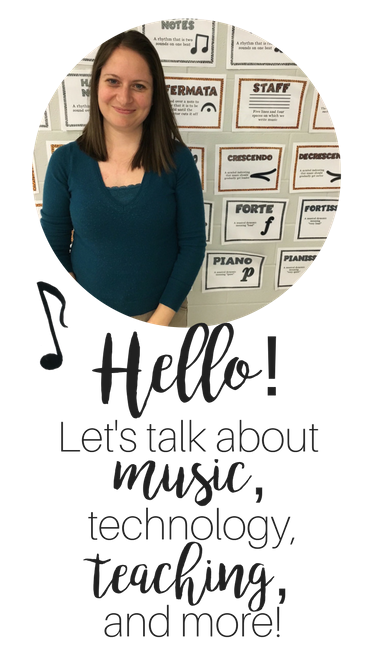 I love the idea of students being really active with their songs and playing out roles for them. I'm currently studying music education and I can definitely see myself using these songs and games in my own classroom. I can't wait to read about more of your ideas! Thank you so much for sharing!